The hydroformylation of long alkenes in microemulsions has already been established in the past funding periods of InPROMPT. The applicability of the process concept with a highly selective homogeneously catalyzed reaction and a highly efficient catalyst recycling, using surfactant modified systems has yet to be transferred towards more complex reactions - like the reductive amination of long-chained aldehydes. 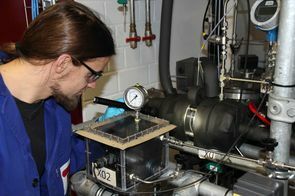 In D2 a fully automated mini-plant is used, to conduct experimental investigations on a continuous process for the reductive amination with rhodium catalysts in multiphase systems. 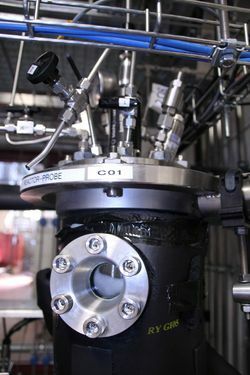 To gain a deeper understanding of phenomena which occur during continuous long term operation and which were impossible to observe in a lab scale, the analytical instrumentation will be extended. Operating data will be used for model identification and validation of single units. 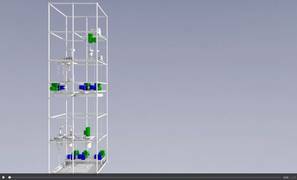 This is done using an online adaptive Optimal Experimental Design and Parameter Estimation framework, which operates above the base control level of the mini-plant, keeping safety layers active. In doing so, the fast track process development for a new process with initially low knowledge on the process is to be demonstrated. Process control strategies for start-up and robust continuous operation will be implemented and tested. 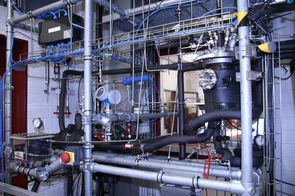 Following the concept of the modular plant design, alternative processes and apparatus designs will be installed, especially to tackle the separation of produced water from the reaction mixture and the overall challenging phase separation step.